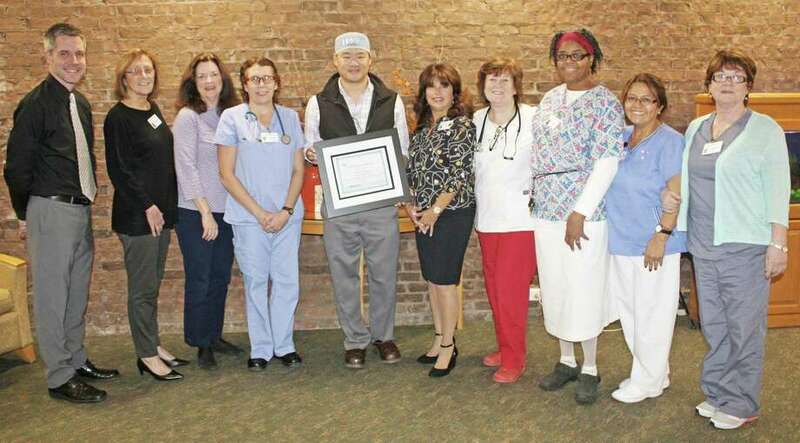 On Nov. 14, Waveny Care Center, Waveny LifeCare Network’s five-star skilled nursing and rehabilitation facility, was named a Certified Center of Excellence for Wound Care Management by VOHRA Post-Acute Physicians — the nation’s largest multispecialty post-acute physician group. This designation is awarded to elite facilities that meet strict criteria and provide superior wound care management programs. VOHRA Centers of Wound Care Excellence must have an outcome-focused, physician specialist-led wound care program with designated wound-certified nurses on-site every day, regular team meetings that focus on quality and process improvement, and, notably, less than a one percent wound-related hospitalization rate. With a top priority on healing and rehabilitating short-term patients to return home, Waveny partnered with VOHRA to bring physician-led bedside wound care to the facility. Each week, Dr. Dennis Ng conducts rounds at the Care Center with Waveny’s wound care team to treat and monitor those with wound and skin issues, reducing the need to send residents or patients out to wound care centers or hospitals. For more information, call 1-855-WAVENY-1 or visit www.waveny.org. Matthew Durkin of New Canaan graduated from Roger Williams University last spring. He earned a bachelor’s of science degree in management from the Providence, R.I., school. This year’s New Canaan Historical Society Holiday Open House will take place Saturday at 13 Oenoke Ridge. Deborah O’Connor will be back after three years to hand cut heirloom quality silhouettes. Appointments are available from 9 a.m. until noon. Individual, group or pet sittings cost $30 per sitting. Copies are $15 each. Children will be able to create their own candy-covered gingerbread houses for $5 each from 9:30 a.m. to 4 p.m. The whole family can enjoy the traditional Victorian tea, complete with petite sandwiches and a variety of sweets, from 12 to 3:30 pm. The price is $12 for members, $15 for non-members and $6 for children under 12. In addition, unique New Canaan gifts will be for sale. Americans at Play, a continuing costume exhibit, will be open. The exhibit features the way people spent their leisure time in the late 1800s and early 1900s and the apparel they wore. Reservations are suggested for all activities. Call 203-966-1776 or email newcanaan.historical@gmail.com. The Sunday School children of St. Michael’s Lutheran Church at 5 Oenoke Ridge in New Canaan will present their annual pageant on Sunday during the 10 a.m. worship service. This year’s pageant is “The First Christmas” by Louise Egan. It will celebrate the story of the night Jesus Christ was born to the world in Bethlehem. Deborah Runestad is directing. The Rev. Dr. Derrick T. Fallon will lead Holy Communion following the pageant. The community is invited to attend. Nursery care will be available. Fellowship hour follows the service. Please register online at newcanaanlibrary.org for events at the New Canaan Library, 151 Main St.
A Joyful Noise: The Norwalk Symphony Orchestra will be presenting a lively look at the many sounds and shapes of percussion instruments on Saturday at 1 p.m. Children and their families are invited to learn about and have hands-on time with the different instruments. The program will be held in the Curtis Gallery. Families with children ages 5-11 are welcome to enjoy this fun, hour-long program that ends with a “petting zoo,” allowing youngsters the chance to make their own music. The Norwalk Symphony Orchestra will also present excerpts from its Joys of the Season Holiday Concert. The program is sponsored by the New Canaan Community Foundation in partnership with the New Canaan Library and the Norwalk Symphony Orchestra. Bestselling author: Wally Lamb, renowned author of The New York Times bestselling novels “She’s Come Undone” and “I Know this Much is True,” will visit the library on Sunday to speak about his new novel, “I’ll Take You There.” The event will take place at 2 p.m. in the Adrian Lamb Room. The world of film making, ghostly connections, and the trials and complexities of being a woman are gracefully and compellingly woven into the story of one young man’s life and the three very important women who helped shape it. Copies of “I’ll Take You There” will be available for purchase, courtesy of Elm Street Books. Lamb lives in Connecticut with his wife, Christine. The Lambs are the parents of three sons. Glass House Presents: Juliet Kinchin, curator in the department of architecture and design at The Museum of Modern Art, will speak about her current exhibition “How Should We Live? Propositions for the Modern Interior,” which explores and examines a range of environments — including Philip Johnson’s 1930 New York City apartment — with the aim of exploring the complex collaborative partnerships, materials and processes that have shaped the modernist interior. Kinchin appears as part of Glass House Presents at New Canaan Library, an occasional series of talks and events about architecture, design, and Modernism in New Canaan and beyond, organized by The Glass House and New Canaan Library. The event will take place Monday at 6:30 p.m., preceded by a light reception at 6 p.m. Please register to attend. Discussing GDP: The library’s World Events, History and Culture book group will discuss renowned economist Diane Coyle’s “GDP: A Brief but Affectionate History” on Wednesday at 7 p.m. in the Plaut Room. Copies of the book are available at the library to read prior to the discussion night. A country’s GDP, or gross domestic product, is a topic of much concern as well as confusion. This entertaining and informative book explains the GDP, making sense of a statistic that appears constantly in the news and politics, and seems to rule our lives — but hardly anyone truly understands. The World Events, History and Culture book group is led by New Canaan resident Ken Hecht, whose interest in and knowledge of history provides a springboard for lively discussion. The group meets monthly to discuss a book that has been selected for its historic, global or cultural significance. A Christmas Carol: Experience Charles Dickens’ classic tale of hope like never before, in a dramatic retelling of “A Christmas Carol” by master storyteller Jonathan Kruk on Thursday at 6:30 p.m. in the library’s Adrian Lamb Room. In a velvet frock and top hat, Kruk embodies every character in this lively, intimate solo performance. The performance is open to the public, but registration is required. The New Canaan Police Union is hosting a food, toy and coat drive on Dec.10, from 9 a.m. to 1 p.m. at the New Canaan Police Department, 174 South Ave.
Meet local police officers and help them fill their cruisers with nonperishable goods, unopened toys and lightly-worn jackets in an effort to help the less fortunate this holiday season. All donations will be given to Vine Cottage on Main Street. In a bid to encourage shoppers to support their neighborhood businesses, the New Canaan Chamber of Commerce — alongside 40 local businesses — proudly present the “Shop Late ‘Til 8” Campaign. Launched on Dec. 1 and running every Thursday until Dec. 22, stores will be open until 8 p.m.
With the holiday lights twinkling in New Canaan, the walking, shopping and dining town has been transformed into a picturesque scene from “A Christmas Carol.” Shoppers can take advantage of key stores’ extended shopping hours and soak up the ambiance. Certain bars and restaurants are rewarding shoppers by offering specials on drinks and food. Take advantage of the offers from Baldanza, Gates and South End Uncorked by showing a receipt from purchases made at local stores that evening after 5 p.m.
Mary Anne Case, a New Canaan resident, is showing her jazz drawings at the Hall of Fame Gallery in the Society of Illustrators in New York City through Dec. 23. Case’s montage “Silvermine” features sketches of musicians she made at Inn Late Jazz over a period of 23 years, when she lived across the street from the historic Silvermine Tavern. Case, a digital cartoonist for 21 years, is a former weekly editorial cartoonist for the Hartford Business Journal. Her resume includes a former daily comic panel, humor cards for American Greetings, freelance editorial cartoons, as well as advertising, book and magazine illustration. Her work has also appeared in the New Canaan News. Case is a professional artist member of both The Society of Illustrators and The National Cartoonists Society. She is a graduate of Brown University and The Rhode Island School of Design. She was head of the art committee of the New Canaan Library for many years in the 1990s.